Accelerate digital transformation. Connect your application and data landscape. Empower business users and IT faster — with intuitive, scalable, and connected integration. Integration needn’t put the brakes on process digitization. Pre-built patterns and Snaps accelerate order-to-cash, hire-to-retire, customer experience initiatives, and more. Collaboratively digitize processes and connect systems, departments, and subsidiaries. The SnapLogic HTML5 visual designer makes it simple for Line-of-Business users, integration specialists, and IT to snap together integrations in hours, not days or weeks–no coding required. Groundbreaking built-in Iris AI learns common integration patterns and drives self-service by recommending flows with up to 90-percent accuracy. View comparison matrix. Sophisticated, yet intuitive transformation power enables migration of hand-coded or legacy integration. Total support for complex transformations, conditional operations, triggers, parameterization, aggregation, and reuse. Get truly data-driven, immediate results, while maximizing flexibility and productivity with a blazing fast platform capable of processing more than 1.4 billion transactions per hour. Agile data integration needn’t compromise governance and security. Centralized object level, granular security and permissions enable integration to be extended to every corner of the organization. Integration performance, user activity, and endpoint utilization monitoring ensure operational integrity with 99-percent uptime. Learn more about SnapLogic Security & Compliance. The SnapLogic Intelligent Integration platform is a powerful and flexible platform that meets a variety of integration needs, all with a unified user interface that is powered by Iris AI. Our no code and low code approach provides maximum productivity from integration specialists to citizen integrators to ad-hoc integrators. You only pay for what you use and can always add capabilities as your needs grow. 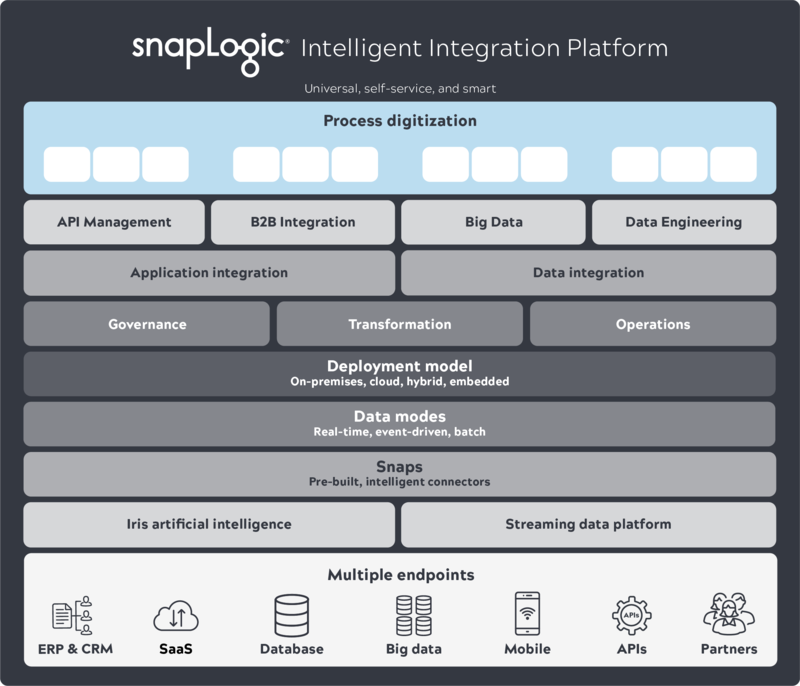 The Snaplex architecture connects data across complex and evolving hybrid enterprise landscapes. Cloudplex unites cloud applications and databases. Groundplex liberates on-premises investments from behind firewalls. And eXtremeplex autoscales transient BDaaS clusters on-demand. One platform: Streaming. Real-time. Batch. Event-driven. SnapLogic’s document-based JSON and REST-based parallel processing architecture manages real-time streaming data for application and business process integration. Scale high-volume batch integration and aggregation for data warehousing and analytics. Connecting endpoints is as easy as drag and drop. More than 500 Snaps connect with ERP, CRM, HCM, Hadoop, Spark, analytics, identity management, social media, online storage, relational, columnar, and key-value databases and technologies such as XML, JSON, OAuth, SOAP, and REST. Ready to try out the Intelligent Integration Platform?